Turn your print into a peice of fine art! There is just something about having your favorite picture printed on a stretched canvas that has the ability to turn it into a stunning piece of art. Creating these images is so much easier and more affordable than it was in years past. At Monsen Engineering we can print your favorite photo on a museum quality canvas and then stretch and staple it onto a wood artists stretcher bar frame, suitable for framing or displaying as-is. 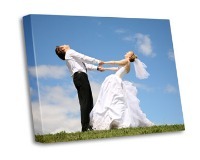 If you are looking to add artwork to your home, produce something professional for your business or are searching for ideas for a perfect gift, a stretched canvas art print is sure to be a treasured piece for years to come. Contact Jason in our Reprographic department for pricing!